Remember two weeks ago how the media got a "racist white woman" fired from her job because she asked an African-American man who swooped into her apartment building behind her to prove he was a resident as the building's rules demanded? The attack was caught on camera around 8 p.m. Friday on Grand Concourse near 182nd Street in the Fordham Heights section. 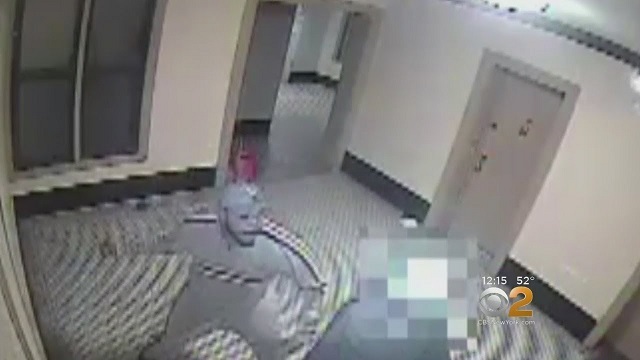 Police said the suspect followed the 63-year-old victim into the lobby of his apartment building and then punched him in the head, knocking him unconscious. The thief then stole $40 from the man’s pocket and his shopping bag. You can see in the video above the attacker caught the door as it was closing, then proceeded to carry out the attack. [...]He was treated for a concussion and swollen eye, and said everything hurts on the side he was hit. Police described the suspect as a black man, approximately 5 feet 9 inches tall, 250 pounds. He was last seen wearing a gray sweater with a blue stripe on the front, matching sweatpants, a blue hat and white sneakers. He was also carrying a red bag. For some reason, the media doesn't seem as eager to cover this story as the other one.